“42” was number one at the box office its opening weekend and my dude Chadwick Boseman was everywhere in the media! He even got a style spread in TIME Magazine. Shelli and I saw the movie. I enjoyed it … but, like I said before, I am a little biased. In the end, I wanted more. But I understand that it wasn’t a bio-pic. This was really a G rated family film, but due to the language of the time, a PG-13 rating was appropriate. This could have easily been R rated if it were more depicting American history of the time with a more raw, different perspective. There was a lot more to the story that they could have shared, but this was about his first season. I am sure that if the film would have explored more of his career, it would have delved deeper into his life. HMMMM … maybe they’ll do another film … “the later years?” Yeah, I wish! Either way … I hope that people enjoyed it and will continue to support the film in upcoming weeks. Last weekend, it was number 3 in the box office. Let’s keep this film out there for our kids to see! AND please continue to support Chadwick Boseman! There was another important outcome of the movie. We see glimpses of Jackie Robinson as a patriotic veteran. More importantly, people looked into the life of Jackie Robinson and went beyond the sugar-coated, storybook portrayal to explore the man. Here we find that in his quest to be a good American citizen, he mindfully helped to destroy the life of one of this country’s most significant personalities: PAUL ROBESON. As an activist, lawyer, athlete, vocalist and film star, Mr. Robeson was more significant to american history than Mr. Robinson. 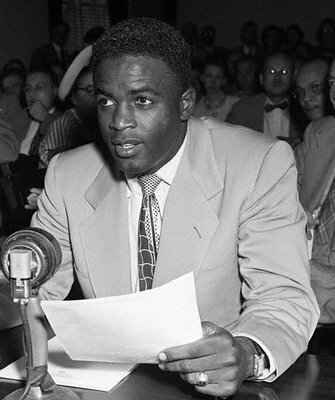 But Jackie Robinson went to congress to speak against Paul Robenson!?! Read more about it here. Years later, Robinson second guessed his actions. Either way, read a little more about the type of man he was through some exerts from First Class Citizenship, where he has some interesting letter exchange between the likes of Martin Luther King Jr, John F. Kenndy, Richard Nixon and Malcolm X. They are all very interesting to me. But I’m a lil’ geeky like that. Enjoyed your comments….I would urge us to read the scantioned biography…the movie captured a couple of years of the man…yes, I thought that the movie was well done, however I have found that it did not capture all….it did show his love of family, a man of discipline grounded through his faith….he was human and super human at times…and what I would consider his flaws, as we all have some, were exceeded by the ground that he plowed and help to fertilize…. I love this movie. It was great!